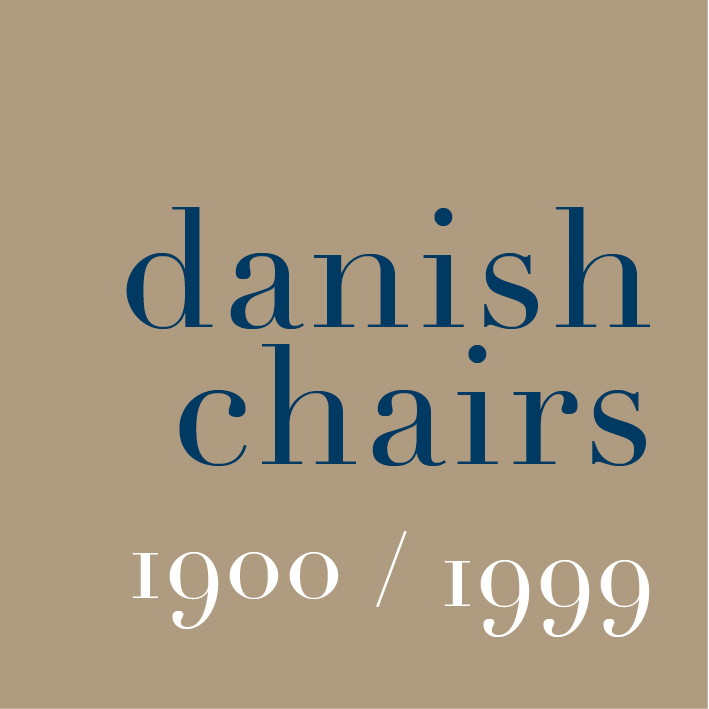 If asked to name an important early modern Danish chair, many people would probably suggest Chair 7 by Arne Jacobsen or possibly a chair by Poul Kjærholm. Probably no one would think of the Red Chair designed by Kaare Klint in the 1920s as the first truly modern Danish chair but surely that would be a valid claim? Now, of course, the Red Chair seems old-fashioned and slightly boring for current taste … so perhaps it appears to be in a bit of a design cul-de-sac … but through the 1930s and 1940s it was a common and popular type of chair. It was the first chair where what we would recognise as 'modern' ideas of simplicity and structural clarity were essential to the design … by that I mean that Kaare Klint analysed what he considered to be the core requirements for a chair - worked out how that could be made and tried to express that rational approach in how the chair looked and he stripped away any unnecessary decoration. Essentially the idea of form following function and material. Part of the problem for us now is that then he took the example of an 18th-century English design as his starting point and in part it is difficult to appreciate chairs of this type because, for modern tastes, they appear to be worthy but rather boring … possibly more suited now and possibly even then to an office or institution than to a home. In fact the chair was designed for the design museum in 1927 and then in 1930 Klint produced a version of the chair with upholstered arms for the office of the Prime Minister Thorvald Stauning with a set of four smaller chairs for the Prime Minister's staff and a set of 12 chairs for his conference room. 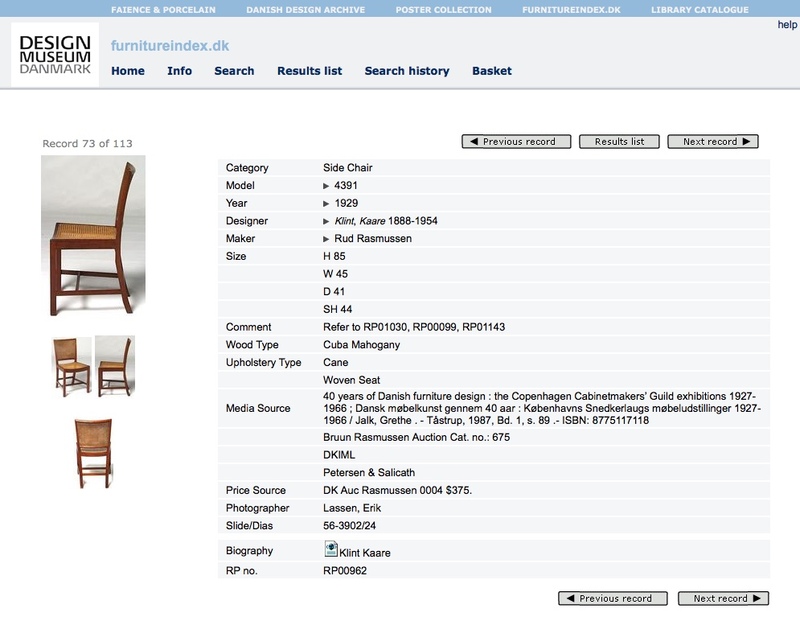 A version of the Red Chair for the Thorvaldsen Museum were also produced by the same cabinet maker - Rud. Rasmussen - that was lighter, with cane seat and back, and for an office on Nørre Voldgade that was designed by Povl Baumann, Kaare Klint designed a chair that was a variation on the Red Chair with a front to the seat that is bowed out. 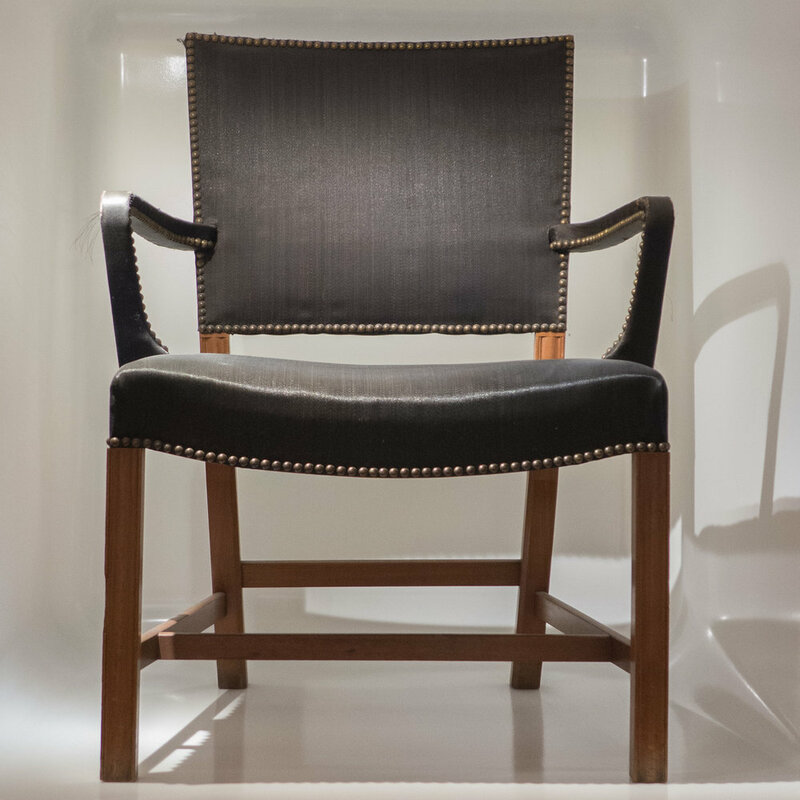 It was a style of chair that went with the slightly severe classic revival taste of some architecture of the period. So the Red Chair type was well designed , well made and sensible, strong - serious. Solicitors and bank managers in England in the 1950s and 1960s sat on chairs like this. After graduating - working first for the University of London and then for the Civil Service - I sat at a desk on chairs that were a variation of this … chairs with straight wood legs, side and cross stretchers, upholstered leather seat, wooden arms, one with a padded leather back rest and the other with a series of thin wood slats across the back. So it was a good chair for offices and serious public buildings. But it was also obvious that this style of chair, even if it was a little formal, had a place in a home. In the first exhibition of the Cabinetmakers in 1927 there was a room setting with furniture by the cabinetmaker Anny Berntsen & Co. 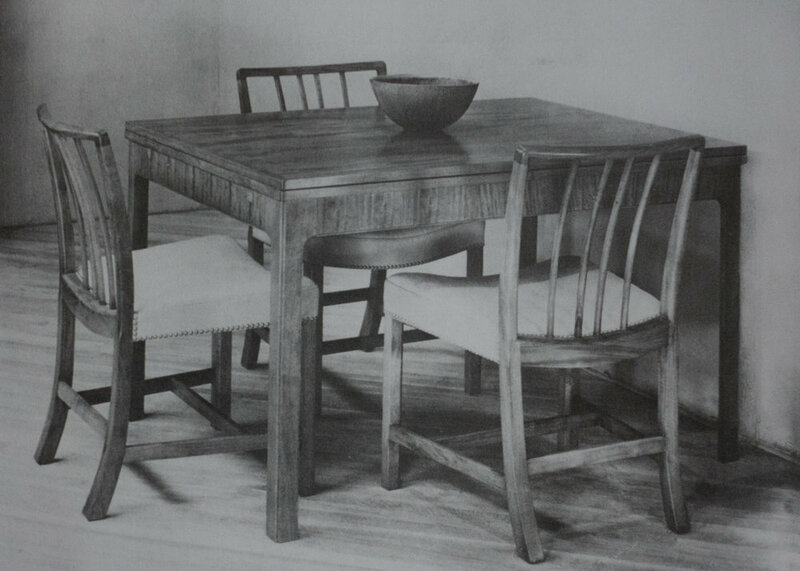 The dining chairs were relatively simple but well proportioned and well made in oak with upholstered square seats that tapered towards the narrower back and the back legs were curved out backwards and tapered so smaller in cross section at the floor than where the rails of the seat are joined. The back legs continued up to support a large square back rest with a gap between the seat and the back, where the frame is exposed, and the back was slightly wider than the uprights and rounded at the top corners so a variation on the Red Chair. The dining table shown with those chairs was square and compact but appears to have had leaves so it could be extended and it looks as if the furniture, even at this early stage, was designed for a relatively small apartment. 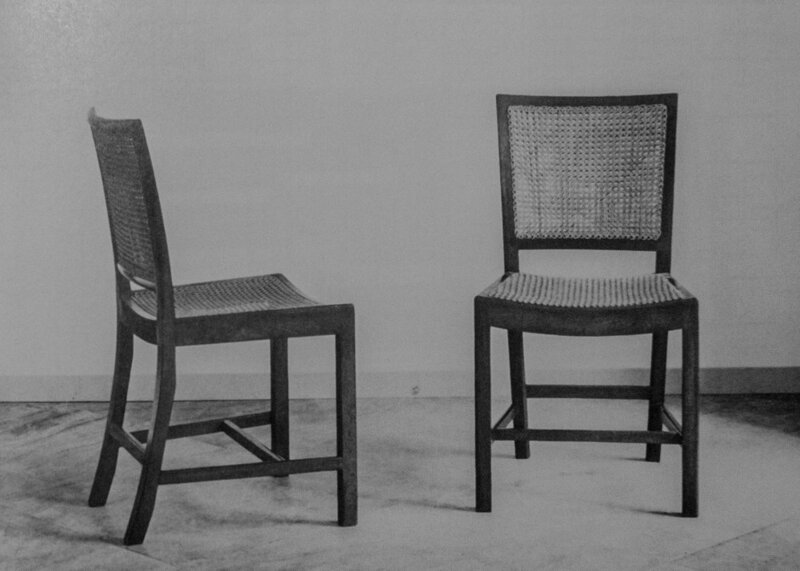 A similar, rather restrained design of chair in elm was shown by Henrik Wörts in 1928. 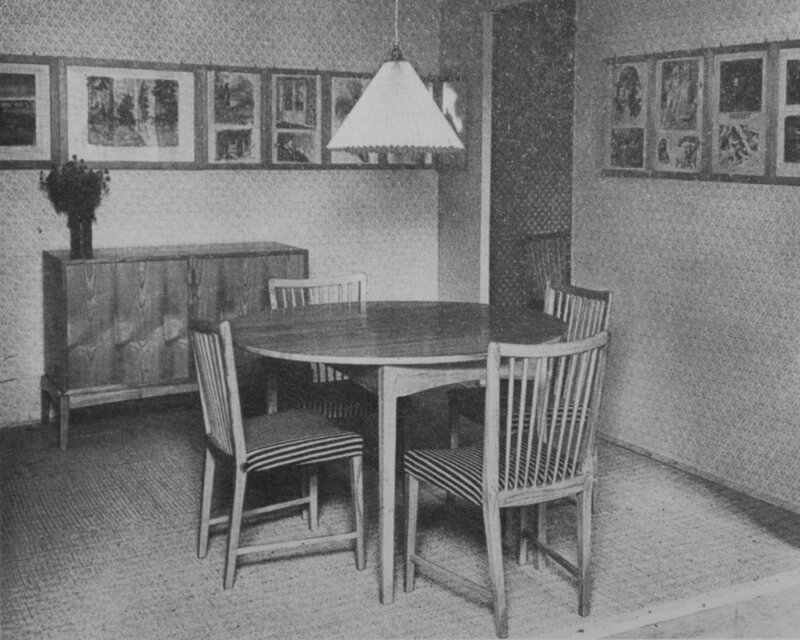 At the Cabinetmakers' Exhibition in 1929 there was another square table with straight, vertical - so un-tapered - legs and chairs in birch designed by Viggo Sten Møller and made by Jens Peter Jensen. The chairs have straight legs but with stretchers only at each side - so not across the back or across the centre under the seat - and the back legs above the seat were tapered and angled back at the top to support a narrower back rest - so not as deep top to bottom as on the Red Chair. These were shown in the room setting as a dining alcove and alongside a double wardrobe, and with a neat low book case on legs with shelves and a day bed with deep drawers underneath - so again the implication is that this furniture was designed for a small apartment. A drawing of the wardrobe shows hanging space on one side, with a hat shelf at the top, and the other half is divided by shelves but the drawing shows tableware and household linen on the shelves which suggest it might even have been for a single room apartment. * It would seem that Møller was suggesting that this good, well-made furniture was appropriate for even the smallest modern home. Another version was shown at the Cabinetmakers' Exhibition in 1930 along with a low cabinet on a stand with sliding doors with a series of deep shelves designed to take a large table setting of china and glassware. 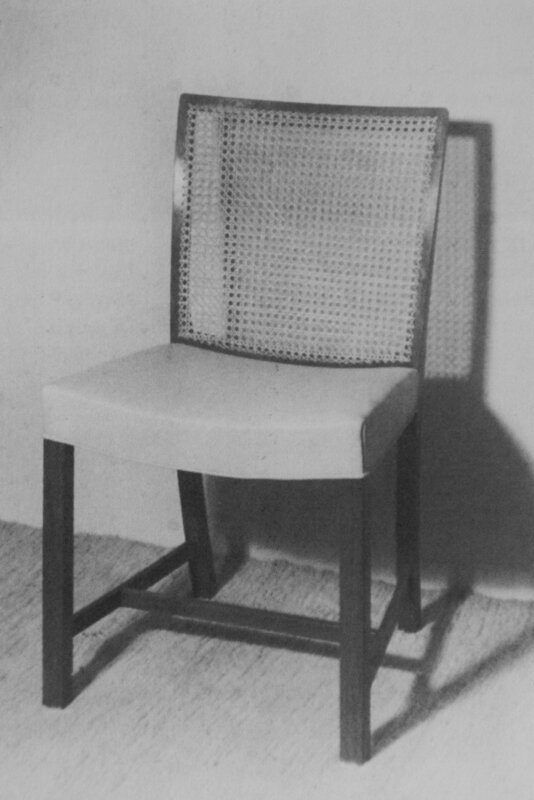 And, in the exhibition in 1932, almost the same shape of chair by Jacob Kjær in Cuban mahogany was shown but possibly because the wood was exotic and expensive the upholstered back rest was replaced by a cross rail just above the seat and a straight top rail with four simple vertical rails grouped in the centre but this is basically the same shape and form and style of chair. 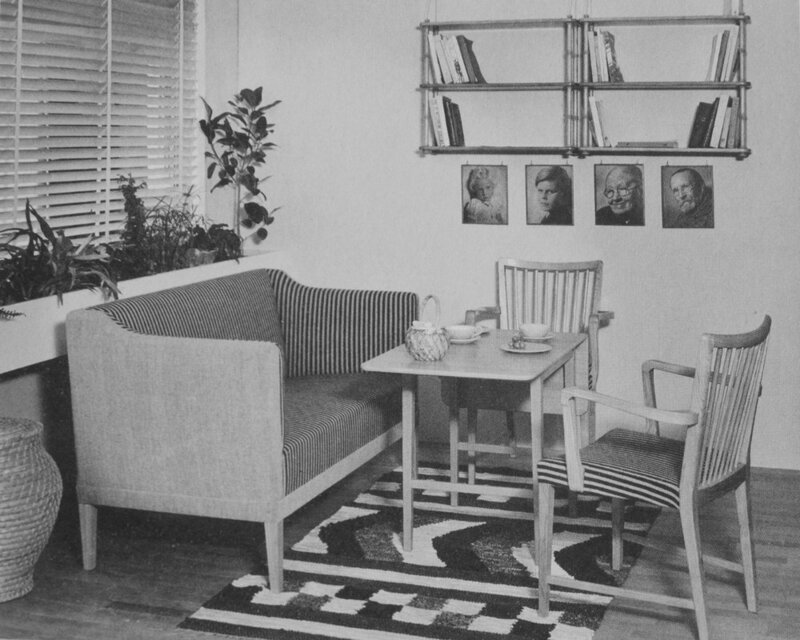 A version of the Red Chair was shown in 1933 with a set of furniture designed by Orla Mølgaard-Nielsen and described as appropriate for a three-room bungalow and a reviewer comments that the design owes much to Klint. What is interesting is that in that review of the furniture it was described as compact but the cupboard was designed to store china, glass and table linen with four sections with doors, two above two, but inside shallow trays on runners held table settings for twelve people. It implies that although the furniture was designed for a relatively modest home, the owners would probably want to be able to feed twelve people with a full set of matching china and tableware that was otherwise stored away in a well-designed piece of furniture. All this shows that architects and the cabinet makers certainly did not see the Red Chair type as primarily an office or museum chair and by the 1940s the chair was being made in more exotic wood for middle-class buyers and was being made to look lighter and more modern. At the Cabinetmakers' Exhibition in 1941 there were a surprisingly large number of exhibitors and Børge Morgensen showed furniture in cherry wood that was made by the cabinetmaker Erbard Rasmussen for a two-room apartment. The bedroom furniture for the exhibition apartment was by Kay Gottlob. A chair by Henrik Wörts with cane back was shown at the Cabinetmakers' Exhibition in 1943 and the Red Chair type appears at the Cabinetmakers' Exhibition through into the 1960s … in 1961 a chair by Gunnar Magnussen and made by Søren Horn was shown which had a cane seat and back and side stretchers and a central cross rail below the seat but by then the next generation of architects and designers were prominent and the Red Chair style became less and less popular. * In Copenhagen the normal way to describe an apartment is without including the kitchen or the bathroom in the number of rooms … so a one-room apartment in the 1920s had a kitchen plus one room that combined living room and bedroom and there might have been a toilet or separate bathroom but in smaller and older apartments toilets might have been out on a landing or outside and shared and baths might have been at a communal bath house. A two room apartment would have had a living room and a separate bedroom plus a kitchen and probably a bathroom.